After a frankly piss poor summerful of movies that made me weep with boredom Don’t Breathe is a breath of fresh air, combining scares and shocks that’ll leave horror fans grinning from ear to ear. Don’t Breathe tells the story of Rocky (Jane Levy) and her friends Money (Daniel Zovatto) and Alex (Dylan Minnette) who resort to burglary in an desperate effort to save up enough money to escape from the urban decay of Detroit. One day though Money receives a tip off about a weak old blind man (Stephen Lang) who keeps thousands of dollars in his house and is apparently completely helpless. Believing he’ll be an easy score the three break into his house where things take a grisly turn when it becomes clear ‘the Blind Man’ was far more prepared than anyone could have expected. Don’t Breathe is everything that a horror movie should be, tense, exciting, more than little nasty and has more twists and turns than the Blind Man’s terrifying basement. Director Fede Alvarez, who also wrote the film, has taken the lessons he learned from directing the Evil Dead remake and crafted a truly wonderful horror film. The standout sequence has to be a chase that occurs in the Blind Man’s aforementioned basement, in which our main characters are blinded by the dark leaving them vulnerable to the Blind Man who knows the room like a spider knows its web. Rather than throw us into the dark though and rely on jump scares or the usual ‘quiet, quiet bang’ (sorry Mark Kermode) he instead uses a night vision camera so we can see everything while our heroes are left in the dark. It’s terrifyingly effective and left me absolutely breathless. Alvarez also breaks the horror movie cliche mould and plays with the idea of morality in a really interesting way that messes with an audiences expectations. In the beginning for example we see our protagonists commit some pretty morally dubious acts and they do choose to prey on a vulnerable old man. However when it becomes apparent quite how dangerous their would-be victim really is our sympathies flip and you’re left praying that they escape the house and the Blind Man. 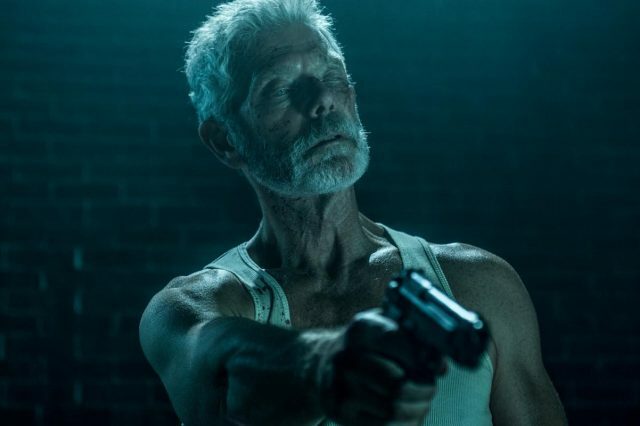 Speaking of Stephen Lang’s Blind Man he’s a wonderfully effective villain that feels more far more mythical than his mundane name would imply and like the best on screen baddies taps into something primordial. Lang gives an incredible performance being scary, threatening and like Frankenstein’s monster ever so slightly sympathetic, at least in the beginning. Ont of the most interesting things about the character is his blindness, which should be a massive weakness but in the confines of his home make him a deadly super predator on the level of horror classics of Freddy and Jason. At the core of the film though is Rocky and her desperate struggle take her sister away from her abusive mother and their hideous lives. It’s a testament to the skills of Jane Levy that despite being a selfish person she never feels unlikable, partially because we can sympathise with her situation and her decisions. That said it helps that the Blind Man is one of the most heinous on-screen baddies of the summer. Don’t Breathe isn’t perfect, it’s definitely over long, but despite that it manages to be an effective and horrifying piece of cinema that walks the fine line between being fun and creepy.